Identity replacement, whether individual or national, can be accidental or purposeful. Sometimes it can be corrected in time. Sometimes it may be too late. Geraldine Hoff Doyle, who many believed to have been the woman featured in J. Howard Miller’s famous historic poster, did not know she was not the real Rosie the Riveter. However, the real Rosie, Naomi Parker Fraley, did know the truth, and nobody would listen to her. Harold Schultz was the Marine in the famous Iwo Jima photo by Joe Rosenthal, and not James Bradley. The Marines knew of their error. Many history buffs knew of the error. But the truth was not officially acknowledged until 20 years after Schultz’s death. Left: Rosie the Riveter, by J. Howard Miller, in the public domain; Right: Raising the Flag on Iwo Jima, by Joe Rosenthal. Used under Fair Use Rule. Most people thought they already knew who that face belonged to: a Michigan woman named Geraldine Hoff Doyle. Her proof was a familiar wire service photograph. And I think we can safely say that most people think they know to whom the land of Israel, or at least the so-called West Bank (Judea & Samaria) really belongs: to a so-called Palestinian people. This oft-used map that totally distorts the truth is one kind of “proof” offered; but who bothers to read the arguments against this propaganda sleight of hand? Oft-used image for promoting lies about Israel. 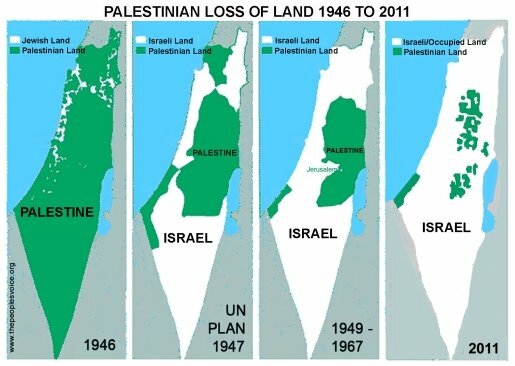 Turning state land into Arab or supposedly Palestinian land. A brief piece in The Economist is just one example of the kind of thing many people will not read. Even people who say they care about the truth. In contrast, there are many journalists, historians, legal experts, politicians and more who try to combat the lies told about Israel. Books and articles debunk the lies. Ben-Dror Yemini’s recent masterpiece does a thorough job of fighting the lies with solid research. But it seems that very few people want to be enlightened. In a recent discussion on Twitter, my discussant dismissed Yemini’s book out of hand. The blurb advertising the book ridicules the accusation of apartheid, so he nixed it. Israelis who care about having our history accurately portrayed understand that turmoil at a very deep level. Ah! Will Israel have such a positive outcome sometime? Somehow I cannot imagine many anti-Zionists being happy to report on the discovery of the true Israel. Were Israel to be defeated and destroyed (God forbid! ), I think it would take more than 20 years for the lies told about us to finally be acknowledged as such. All those who currently have a vested interest in the demise of the Jewish state would have to be dead and buried. At least. Our obliviousness to Schultz during his lifetime—and the eerily similar circumstance that faced Parker until it was almost too late—suggest that our culture’s insatiable thirst for instant celebrities can easily overwhelm the need for careful scrutiny of those whom we would admire. And here I need to wonder: what is it about the so-called Palestinians that arouses admiration in their promoters? Is it enough to support death of the Jewish state for one to be a cause célèbre today? We pay a price, historically, for our haste. Worse, those whom we forget or ignore pay that price in terms of one the cruelest kinds of identity theft. Don’t we just know it! Post Script: I do not have any idea what the eventual solution should be. I agree that today there is a group of Arabs who view themselves as Palestinians, as somehow distinct from other Arabs, and as deserving of a political designation that would cement that separate identity. I do not think that anyone knows how resilient that identity is, nor how long it would last were Israel to lose a war and be overrun. In any case, any solution advanced needs to be based upon the truth. Nothing else would work. Not for them and not for us. Because building your identity on a lie has a way of backfiring. Image credits: Rosie the Riveter, by J. Howard Miller, is in the public domain. Raising the Flag on Iwo Jima, by Joe Rosenthal, is used under the Fair Use Rule. Next story Reem’s Bakery To Jews: In Yo’ Eye!